Just in at Masterpiece we have a nice 1976 MG Midget Roadster with 50,292 mile on the odometer. The Midget is finished in an Orange paint, which is in very good condition, and has a complementary offset black vinyl interior and black convertible top. Overall, this car is in very good condition. This 1976 MG Midget Roadster is a very acceptable automobile, it runs and drives well. The MG is powered by a 1,493cc 4-cylinder engine and matched to a 4-speed manual transmission. The ’76 starts up smoothly, runs and drives and shifts very well. The convertible top is very good condition, without rips or major wear marks. This is a classic British Sportscar that is looking for a new home. The body is in good shape, the interior is great, the motor runs well and the undercarriage looks good, as you can see in our photos. Call or email us today with any questions! 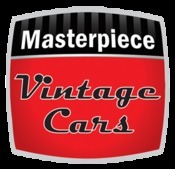 Masterpiece Vintage and Classic Cars offers a very desirable collection of fine automobiles and special interest vehicles. We set high standards for the models we seek, the condition they are in, and the overall beauty they represent - and also run our facility in the same detail-oriented fashion.